I came to Kenya partly to help make a PBS documentary about empowering women as a way to lift families and communities — men included — out of poverty. And I promptly met a prostitute-turned-businesswoman who epitomizes that theme. Jane Ngoiri is a 38-year-old single mom who grew up in a slum and dropped out of school after the eighth grade. She married at age 18, but when she was pregnant with her second child, her husband informally took a second wife (polygamy is common for Christians here as well as Muslims), and she was nudged out. Jane soon found herself with small children, no home and no money. To survive, she sold her body for the next five years. It was a perilous existence in Mathare, a collection of dangerous slums in Nairobi. The area, a warren of winding, muddy alleys, is consumed by crime and despair. Regular jobs are rare, and many men self-medicate in ways that perpetuate self-destructive cycles of hopelessness. Social workers estimate that one-third of the slum’s men get drunk every night — spending about $1.50 an evening, which could otherwise finance their children’s education. Poverty becomes self-replicating. Then in 1999, Jane joined an antipoverty organization called Jamii Bora, which means “good families” in Swahili. The group, founded by 50 street beggars with the help of a Swedish woman, Ingrid Munro, who still lives in Nairobi, became Kenya’s largest microfinance organization, with more than 300,000 members. But it also runs entrepreneurship training, a sobriety campaign to reduce alcoholism, and a housing program to help slum-dwellers move to the suburbs. In Jamii Bora, Jane was pushed to save for the future, to lean forward. There is growing evidence that the most powerful element of microfinance is not microlending, but microsavings, and that’s how Jamii Bora starts: it encourages members to save small amounts, perhaps just 50 cents a week. Then members are coached to use those savings, coupled with loans and training, to start tiny businesses. Jane learned to sew, left prostitution and used her savings and a small loan to buy a sewing machine. She began buying secondhand wedding gowns and bridesmaid dresses for about $7 each, and then cutting them up to make two or three smaller dresses. 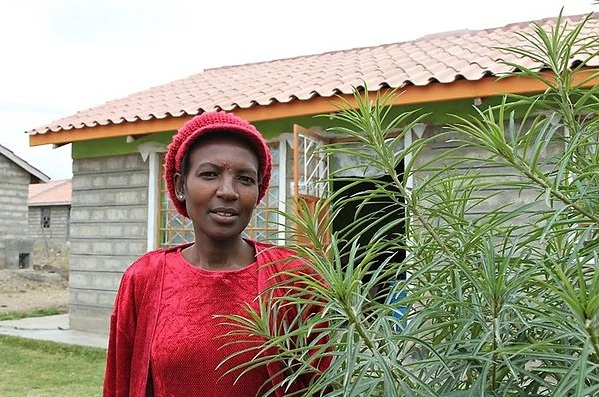 Jane’s business flourished, and she used her profits to buy a small home in a safe suburb and to keep her children in school. Her eldest daughter, Caroline, became the first child in the family to graduate from high school and is now taking computer classes. The intellectual star of the family is Anthony, the second child, who is ranked No. 1 in his class of 138 pupils at a good boarding school with much richer students. Anthony, a star soccer player even though he has no soccer shoes, hopes to go to college and become an engineer. He told me that when he gets his first paycheck, he’s going to buy something beautiful for his mom — and his eyes glistened as he spoke. Another child, Cynthia, a seventh grader, has just been chosen by teachers to become head girl of her school next year, a tribute to her grades and leadership. Jane hopes to send Cynthia, who dreams of being a lawyer, to a good boarding school as well, but it’s difficult to see how she will pay all these tuition costs. Careful research by Professor Esther Duflo of M.I.T. and other economists suggests that microfinance can chip away at poverty but is not a panacea. You see that in Jane’s life. After I finished my interviews, catastrophe struck. Cynthia’s big toe was mangled in a traffic accident, and ultimately it was amputated — a disfigurement in a country where people routinely wear sandals. Jane devoted every scrap of savings to medical costs — leaving Anthony unable to return to school. Our documentary team took up a collection, and Anthony is now back in class. But the crisis was a reminder of how fragile the family’s gains are. Jane’s life reflects the lesson of mountains of data: overcoming poverty is a tumultuous and uncertain task, but it can be done. There’s a tendency these days to give up on poverty, to dismiss it as a sad but inevitable feature of humanity, particularly at a time when we have deep economic problems of our own. But if a former prostitute in a Nairobi slum can build a dressmaking business, buy a home in the suburbs and produce over-achievers like Caroline, Anthony and Cynthia, then it’s worth remembering that sheer grit, and a helping hand, can sometimes blaze trails where none seem possible. If readers want to help by sending Jane old bridesmaid dresses to boost her sewing business, I have information about how to do so on my blog. Somali militants on Monday threatened to bring down Nairobi skyscrapers after Kenya sent hundreds of troops into Somalia. The threat emanated from the same lawless country in which the al-Qaida masterminds behind 1998 bombings of two U.S. embassies sought refuge. The Kenyan invasion comes at a time when al-Shabab has been weakened by famine in its strongholds, has been pushed from the capital of Mogadishu by African Union troops and finds itself increasingly challenged by clan militias. The U.S. has also launched airstrikes against al-Shabab leaders amid concerns over terrorist training camps in the failed state of Somalia. The men who masterminded the 1998 bombings of U.S. embassies in Kenya and Tanzania found shelter in the chaos of its 20-year-old conflict. The statement urged Kenyans to tell their “saber-rattling politicians” to not let the “flames of war” spill over into Kenya, destroying the East African nation’s sense of stability. “Your skyscrapers will be destroyed, your tourism will disappear. We shall inflict on you the same damage you inflicted on us,” Sheik Ali Mohamud Rage, a spokesman for the Islamist militia al-Shabab, said at a Mogadishu news conference. 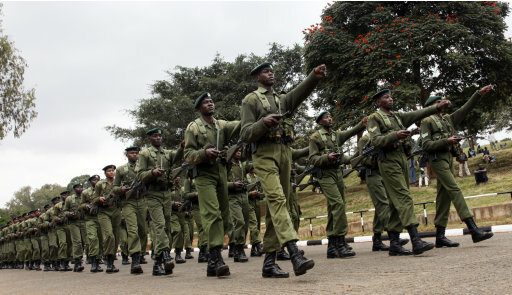 Kenya on Sunday moved two battalions of about 800 troops each across the border in two locations, a Nairobi-based official said. Tanks, helicopters and artillery have also been deployed. The invasion is the most significant foreign deployment of the Kenyan military since independence from Britain in 1963. The official asked for anonymity because he was not authorized to speak to the press. Maj. Emmanuel Chirchir, a Kenyan military spokesman, would only say there were “sufficient” troops in Somalia. He would not disclose their final objective, how long they were prepared to stay or any other details. He did say that five Kenyan military personnel were killed when their helicopter crashed near the border on Sunday. Kenya says the invasion is retaliation for the kidnappings of four Europeans — two aid workers and two tourists — from Kenyan soil. An Englishwoman was taken last month by gunmen who killed her husband, a Frenchwoman was seized two weeks later and two Spanish aid workers were taken from a refugee camp near the border on Thursday. The attacks have already hit Kenya’s tourism industry, the country’s third biggest foreign exchange earner last year. But Europeans have been kidnapped before, and it is still unclear if al-Shabab carried out the attacks. Analysts also say it is “highly unlikely” that Kenya could organize such a complex military operation so quickly. “The kidnaps could be a catalyst for something in the works for a long time,” said Lauren Gelfand, the Africa and Middle East editor of Jane’s Defense Weekly. The Kenyans had already been conducting air strikes in Somalia for the past two weeks, a Nairobi-based diplomat said. He asked for anonymity because he was not authorized to speak to the media. Al-Shabab itself dismissed the kidnappings as a motivation. “The allegations put forward by the Kenyan authorities with regard to the recent kidnappings are, at best, unfounded and, apart from the mere conjectural corroborations, not substantiated with any verifiable evidence,” the al-Shabab statement said. Last year al-Shabab suicide bombers killed 76 people in Kampala, Uganda as they watched the World Cup final. The group said it was retaliation for Uganda sending troops to the African Union force supporting the weak U.N.-backed government. Rage, the al-Shabab spokesman, raised the image of the bombings Monday. “Remember what happened in Uganda’s capital,” he said. So far al-Shabab has put up little resistance to the Kenyan forces, melting away into the thorny scrub. A militia supported by the Kenyans took control of Qoqani, about 60 miles (100 kilometers) from the Kenyan border, late on Sunday, residents said. Residents in the nearby town of Afmadow said al-Shabab fighters were leaving, but that families were also fleeing into the bush, preferring to sleep in the open and face wild animals than risk any fighting. “We know there are lions in the jungle but fighting is worse,” said Abdiqadir Mohamed. Kenya’s final objective remains unclear. It has spent the last two years pushing for a buffer zone between itself and troubled Somalia. Kenyan forces trained and equipped the so-called Jubaland militia of more than 2,000 Somalis and have frequently said they want to take Kismayo, a port city whose customs revenues are the insurgency’s biggest cash cow. Al-Shabab’s key line of defense for Kismayo is in front of the Juba river. There are only three bridges across it strong enough to take the movement of vehicles. On Monday, bearded men wearing masks drove around Kismayo, using megaphones to urge residents to join the fight, residents said. The insurgents have a history of kidnapping children to use as child soldiers. Families in Kismayo said they were already fleeing, fearing forced recruitment.